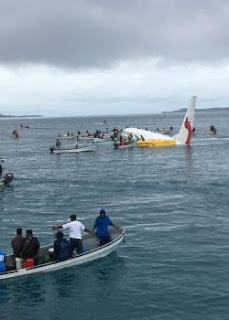 A Fijian psychiatric physician was among 47 passengers and crew who survived the Air Niugini flight, PX073, that crashed in Chuuk, Federated States of Micronesia, last Friday. Victor Harold Wasson, 38, was on his way home when the Boeing 737-800 aircraft crashed into the sea. He had travelled from Pohnpei and was to transit through Papua New Guinea and Australia and then on to Nadi. The cause of the crash and the exact sequence of events that led to it remain unclear. Air Niugini and the US Navy said the plane landed in the lagoon short of the runway. Witnesses interviewed immediately after the crash said the aircraft appeared to overshoot the runway and ended up in the sea. “The plane overflew the runway and landed 150 metres past the retaining wall at the end of the runway, which opened directly into over 80-90 feet of water. “There was panic in the plane despite the senior flight attendants attempting to reassure everyone … some passengers were climbing over seats to get to the exit … water was flowing into the plane quite rapidly. “In the first few minutes water was already halfway up to my knees. Dr Wasson kept thanking God that he and others were still alive. “I was thinking of my family and kept telling myself that the Lord has a plan for me and things won’t end abruptly like this,” he said. He remembers that there was an announcement about the planned (normal) landing and for the fastening of seat belts. “But when we overflew the runway there was an announcement to ‘brace for impact’, but everything occurred really quick that many were unable to react in time. “The impact happened just as the announcement was completed. “The fishing boats arrived within three to five minutes after impact and the first responders after 10 minutes. At their home in Pohnpei, Renuka Nand Wasson received a call from her husband’s colleagues about the incident. “I received a phone call on Victor’s phone, which he left behind at home, and I answered it. A colleague was asking about Victor and if I went with him in that plane. “When he said ‘in that plane’ I knew something was wrong, but he didn’t want to tell me because he was unsure about what happened and if Victor was okay. “I insisted and he informed me that the plane Victor was travelling in crash landed in Chuuk. Two hours later Mrs Wasson finally received a call on Facebook messenger from her husband. “I was so happy to hear his voice that all I could do was cry. He told me that he’s okay and for me not to cry,” she said. “He told me to take care of our daughter and not worry and that he loved me. “He has reached Fiji safely, but I am still worried. I know he has gone through a lot. After the Friday incident, the Fiji Mission in Papua New Guinea established contact with Air Niugini and worked to confirm the recovery flight arrival in Port Moresby. High Commissioner Esala Teleni and his wife were on hand on Saturday afternoon to receive Dr Wasson on arrival. Fiji High Commission First Secretary Vilitati Mataitini said they were thankful to Air Niugini for looking after the passengers well on their arrival and the onward travel to their respective destinations. “Like the rest of the passengers, Dr Wasson lost everything. However, his passport was intact so his travel home was facilitated easily. “Through the Fiji High Commission, the Fijian community in Port Moresby collected a suitcase and clothes to support Dr Wasson until his flight home on Sunday morning. “Mission staff were at the airport to farewell our survivor on his way home,”Mataitini said. Wasson arrived in Nadi at 6pm on Sunday. Dr Wasson has maternal links to Dawasamu, Tailevu.